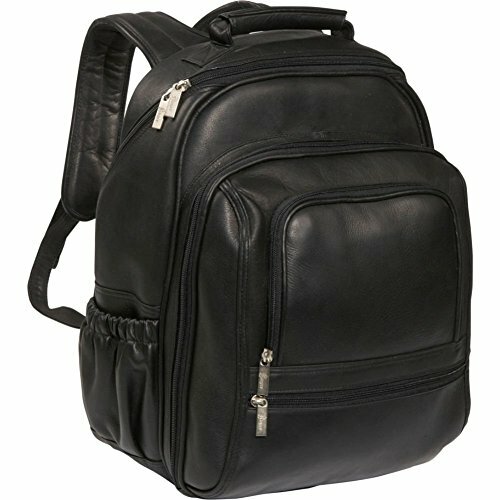 With a large zip down main compartment with padded computer sleeve, this handcrafted vaquetta genuine leather backpack features a large front zip compartment with 2 section file down, pen holder and leather business card holder, the front features an organizer compartment for iPhone as well 2 mesh zip pocket, one quick access large zipper pocket, right side flap over pocket for quick access of iPhone. The left side features an elastic leather pocket for water bottle or umbrella. A convenient padded top handle, adjustable padded back straps and 4 sturdy metal feet for stability and protection completes this beautiful backpack. Laptop compartment 11 1/2 x 11 1/2 x 2.